A mechanical watch is always something of a luxury, but there are some objects out there that enable you to discover the pleasure of co-habiting with something that can live at least as long as you will, that has its own tiny beating heart, and that will never need a new battery. Here are some of the three-hand watches launched in 2016 and that are available for under €1,000. 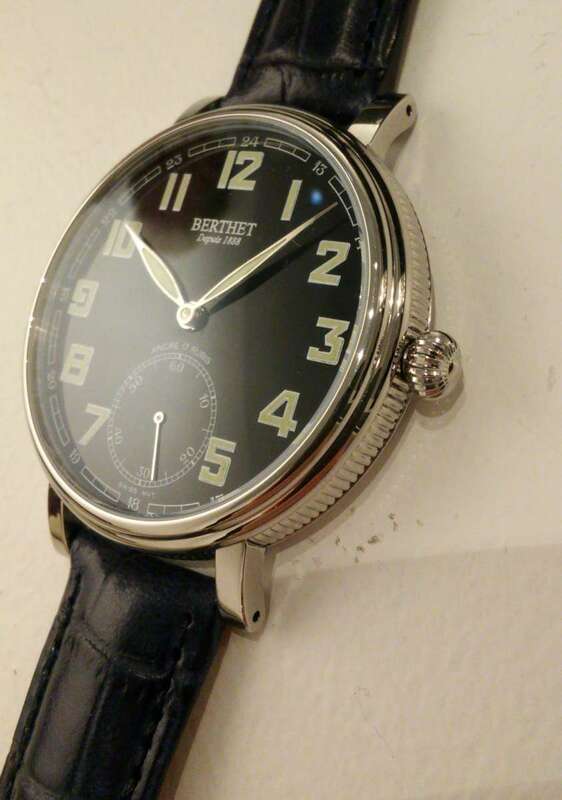 Berthet is one of the few watch brands still operating in France. This piece has a 43 mm case in stainless steel, beautifully finished, with fluting on the caseband. The hand-wound movement, visible through the sapphire caseback, is built by the company on the basis of the classic Unitas 6498-1, nicely finished with Cotes de Genève, blued screws, and chatons for the bearing rubies. The movement provides 46 hours power reserve, and the balance runs at 18,000 vph (2.5 Hertz). It’s a watch whose quality and authenticity are obvious from the very first glance. At a price of €495 before tax, this watch is a very attractive proposition. Read more here. Steinhart’s watches often remind you of something else, and this has touches of Bell & Ross and Panerai, but the overall effect is attractive and original. In addition to the three hands for time, there is a fourth skeletonized hand for a second time zone indicated on the peripheral 24-hour scale. The nicely-detailed case, large at 44 mm width, fairly thick at 14.8 mm, includes a sapphire caseback revealing the Swiss-made self-winding Soprod movement SOP 9384 / A10-24, running at 28,800 vibrations per hour, 42 hours power reserve. Price €740, available online from the Steinhart website. Available in several versions, DS-1 is an attractive three-hand watch, at prices ranging from €665 to €745. The most interesting version is the Himalaya Special Edition commemorating the ascent of the Dhaulagiri peak in 1960. Inside, the watch is powered by the self-winding ETA Powermatic 80, which supplies 80 hours power reserve. Powermatic 80, ETA CO7.111, is part of ETA’s new generation of movements, in which power reserve is doubled from the 40 or so hours of the class ETA 2824 movements. 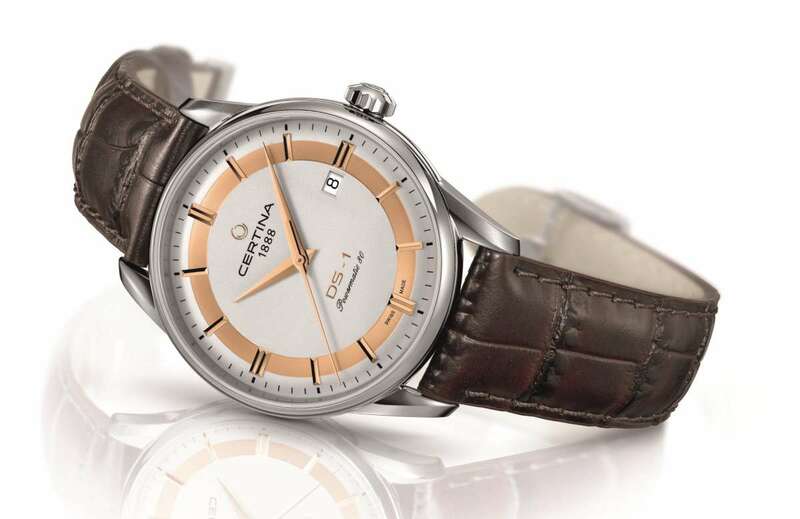 The case is the Certina DS (double security), providing water-resistance of 10 bar (100 metres). It has a sapphire caseback revealing details of the movement. The watch costs €710, 725 Swiss francs, £530. Read more here. The Sinn 556 I M is a sports watch with a 38.5 mm stainless steel case, 20 bar (200 metres) water resistance. The ETA 2824-2 self-winding movement has basic finish and a Sinn oscillating weight, and it provides about 38-40 hours power reserve. 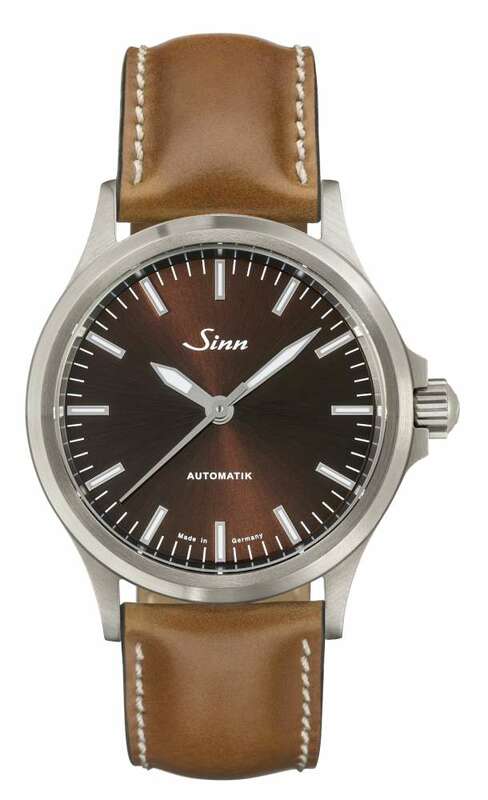 You can purchase the watch online from Sinn, with a variety of strap options, leather strap, stainless steel bracelet, or black silicone strap. The drilled lugs make strap changing simple. The starting price, for the version with leather strap, is €990. Read more here. The Pilot 42 HandWound Bronze by Archimede has a bronze case with a brushed finish, and a screw-down steel caseback with mineral crystal providing a view of the movement. It is water-resistant to 5 bar (50 metres). The watch is 42 mm in diameter and 9.8 mm thick. The movement is the ETA 6498, a hand-wound calibre with small seconds at 6 o’clock. Archimede don’t specify the balance speed: the 6498 runs at 18,000 vibrations per hour (2.5 Hertz) or 21,600 vph (3 Hertz). Power reserve is about 50 hours. 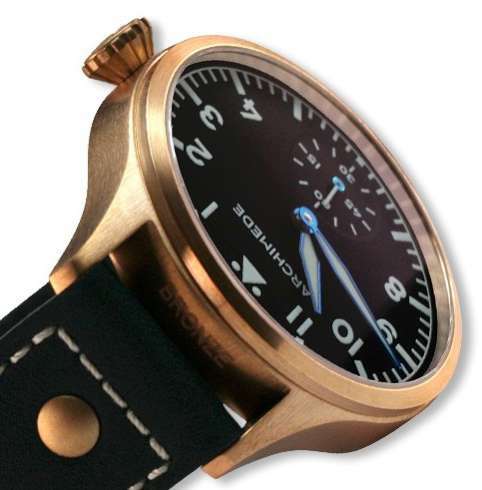 The Pilot 42 HandWound Bronze by Archimede, costs €920 inclusive of tax. It is available direct from the Archimede website. The same watch is available with steel case at €680. Read more here. The “regulateur” was a clock installed in workshops in the 18th and 19th centuries to check the accuracy of the pocket watches that were being made. The regulator typically had a single minute hand referencing a chapter ring around the outside of the dial, an hour subdial below, and a deadbeat seconds subdial above. This watch reflects the pattern, with two subdials, hours above, seconds below. The case is in steel in a range of finishes, 39.3 mm in diameter, 11.55 mm thick, standard water resistance of 3 bars. The movement is the self-winding ETA 2825-2, providing 38 hours power reserve. 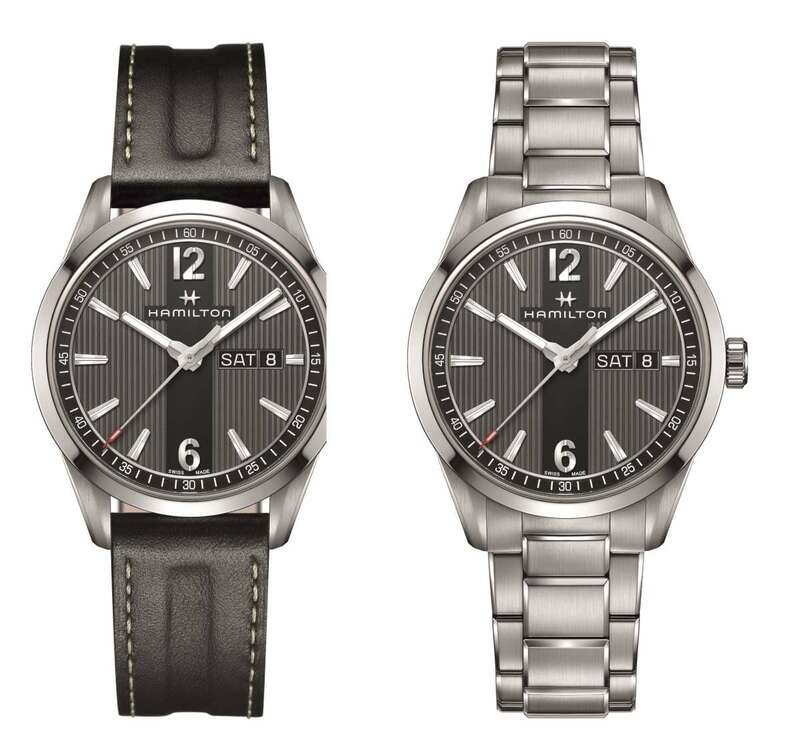 The cheapest version with steel finish, black dial and black leather strap costs €720,£535, $795. 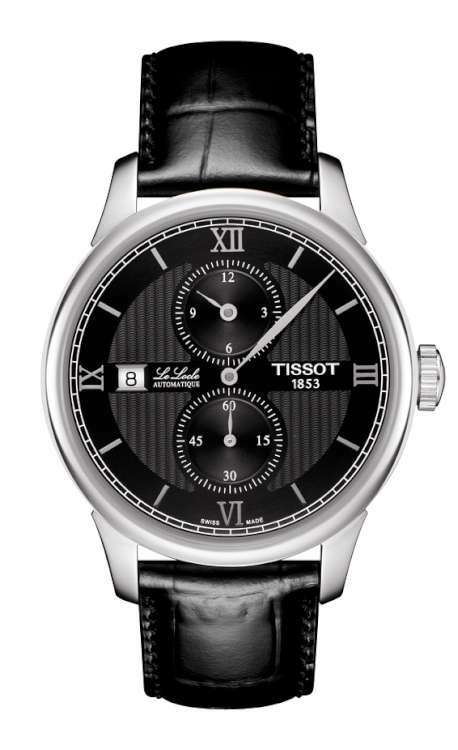 Available on Tissot online stores. Read more here. 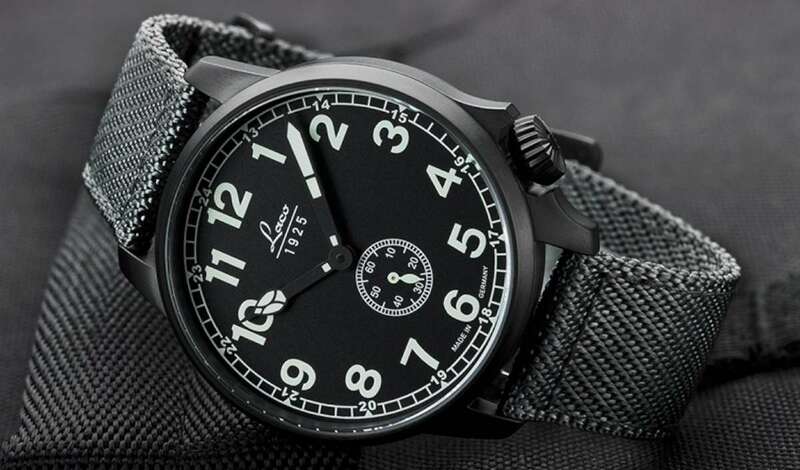 Part of Laco’s collection of pilot’s watches, the Ju 52 is a very wearable model with a 42 mm stainless steel case, 12.8 mm thick, with black PVD coating that gives it a sleek, modern look. The watch is part of the Type C collection, linked to pre-WW2 watches with cathedral hands and small seconds subdial at 6 o’clock. Inside is the self-winding Laco 18 mechanical movement, which is the Miyota 8218, made in Japan and part of the Citizen group. It provides a precision of -10/+20 seconds per day, and a power reserve of about 40 hours. The Laco Ju 52 costs €498 inclusive of VAT. Read more here. OK, it doesn’t have the prestige of a Piaget, but the Mido Baroncelli Heritage is nonetheless admirably thin at 6.95 mm, and works very well as a dress watch at a price of €880 in steel and €980 in rose gold PVD-coated steel. The watch has a polished steel case 39 mm in diameter (water resistance 3 bar, 30 metres) with a stepped bezel, and a black grained dial with minimalist baton hour markers. 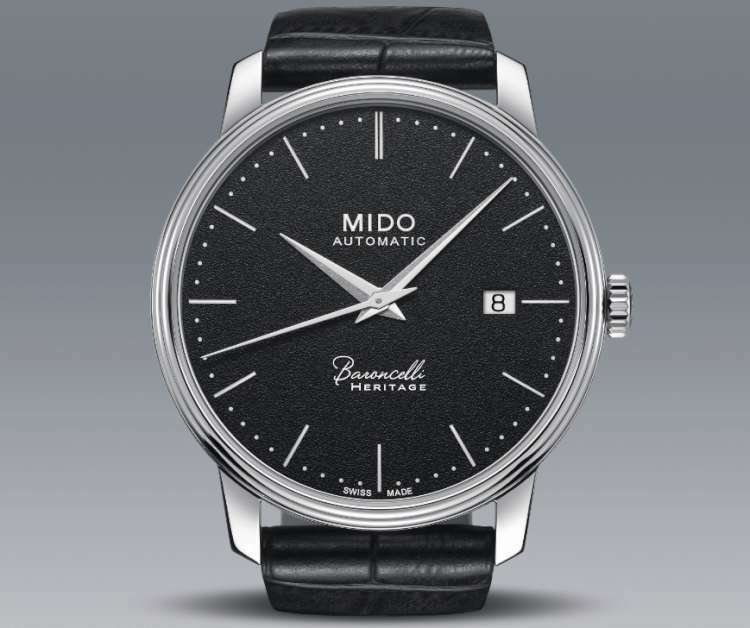 Inside, the self-winding movement is the Mido 1192, based on the ETA 2892-A2. It has an oscillating weight decorated with Côtes de Genève and the Mido logo. The movement runs at 28,800 vibration per hour (4 Hertz), and has 42 hours power reserve. The Mido Baroncelli Heritage costs €880 in steel. Read more here. The Hamilton Broadway collection was inspired by New York’s skyscrapers, interpreted on the dial by narrow vertical ribbing. An interesting feature is what looks like a slightly darker vertical line running along the strap (created by a slight depression in the leather) and vertically across the dial – recalling the street after which it is named. The Hamilton Broadway Day-Date Auto 42mm watch has an elegant, slim steel case, with alternating areas of satin and bright finish, and a narrow black PVD-finish ring between the case and bezel. The watch is powered by the H-30 movement made by ETA exclusively for Hamilton. It provides 80 hours power reserve. The watch costs €895 in the version with leather strap, and €945 in the version with steel bracelet. Read more here. The Group B by Brooklybn-based brand Autodromo is a collection of four automatic watches inspired by Group B rally cars (such as the Lancia 037 Stradale) whose combination of high power and light construction made them very fast and very dangerous. 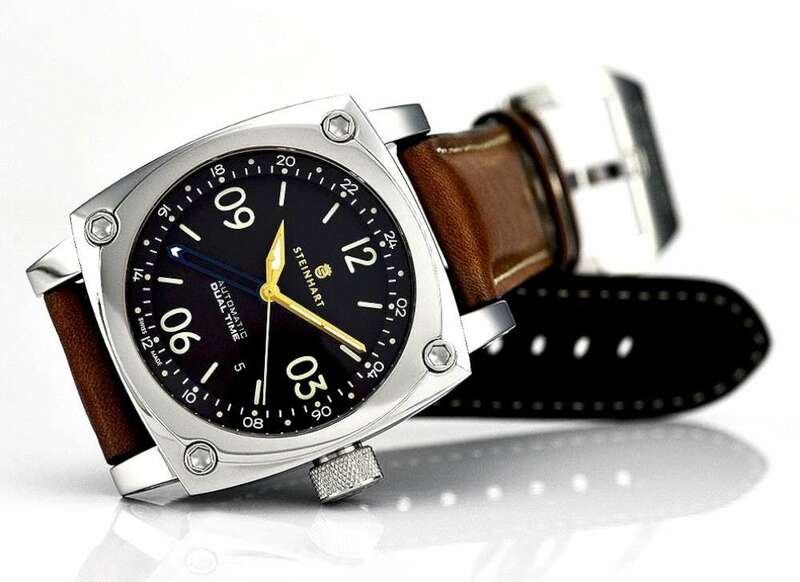 The Autodromo Group B has a lightweight 39mm diameter titanium case, 9 mm thick. The design is a 1980s classic, a circular capsule in a flat, brushed-steel outer case. 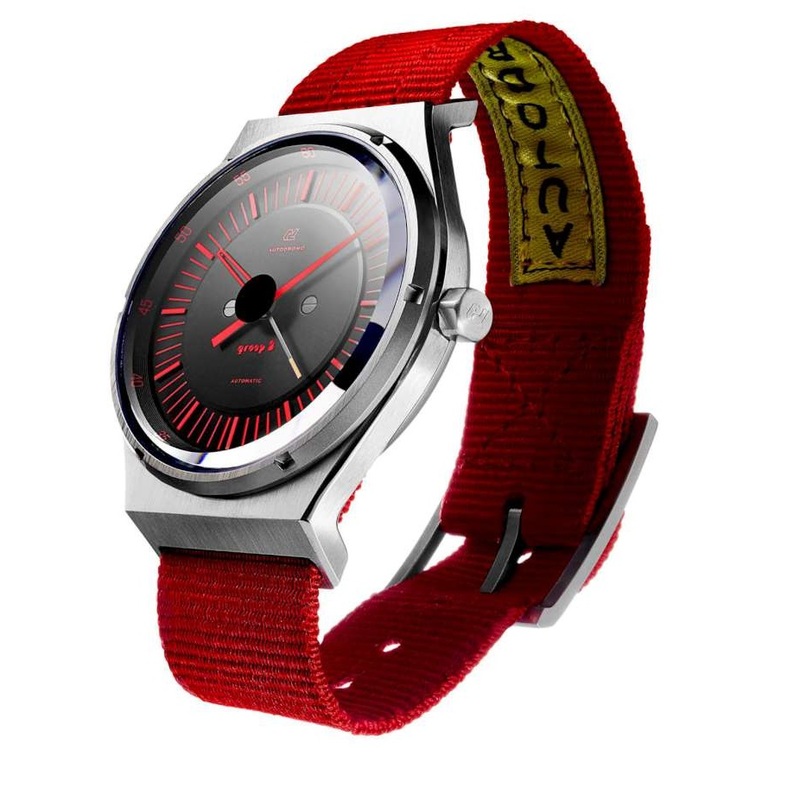 The strap is in nylon, reminiscent of racing harnesses, and two are provided with each watch, grey and red. You can change them easily without tools, a very nice user-friendly touch. The caseback is solid: inside, the Japanese-made Miyota 9015 automatic movement includes the stop-seconds function for precision time-setting. It has a power reserve of about 40 hours. The watch costs $950 and it can be ordered on the Autodromo website. Read more here.